The G3GRID procedure processes an existing SAS data set to create a data set that the G3D procedure or the GCONTOUR procedure can use to produce a three-dimensional surface plot or a contour plot. The procedure creates a data set whose horizontal X-Y variable values form a complete grid, and it interpolates the values of the vertical Z variable for each point on the X-Y plane. The G3GRID procedure does not produce graphics output. PROC G3GRID produces an output data set that you can use as the input data set for PROC G3D or PROC GCONTOUR. Scatter Plot of Data Set before G3GRID Processing (gtgdefin), and Surface Plot of Data Set after G3GRID Processing (gtdefin) illustrate the effect of the G3GRID procedure on data. This figure shows a collection of data points, where z=f(x,y). 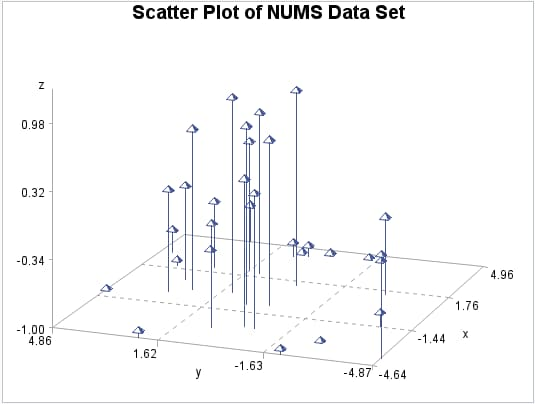 These points are randomly distributed, and cannot be displayed with a G3D surface plot, although they can be displayed with a scatter plot. 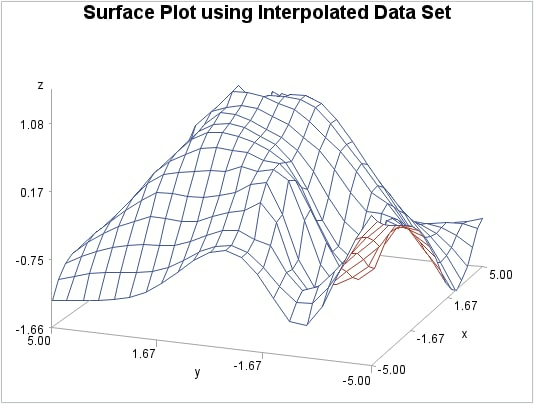 The following figure shows a surface plot of the data set that is created by a G3GRID interpolation of the original data set shown in the preceding figure. The evenly distributed horizontal (x,y) data points form a grid for the three-dimensional plot.